I foolishly decided to see and review all the movies listed on the National Film Registry. Like some weird American Everest, it beckoned to me. And, since I’d written about everything from grand opera to midget wrestling, I figured I can take it. We’ll see. It’s the kind of obsessive, analytical task into which I can sink my teeth, and I hope it answer questions and provoke some about what American significance constitutes, cinematically speaking. There are 550 selections to date. Of course, right off the bat my completist impulses sent me scurrying through the master list of movies to see how many I had actually seen to that point. I scored 285 out of 550, or 51.8 percent. Not too shabby . . . with a few exceptions, I can talk about them without running them again. But what haven’t I seen? What do the gaps say about my movie-going habits? I have, of course, avoided some of those “Oh-you-really-have-to-see-these-sometime” films such “The Birth of a Nation.” Even though I love Billy Wilder, can I honestly say I’ve never seen “The Apartment”? Or “The Exorcist”? Or “Love Finds Andy Hardy”? I decided to plow through the selections chronologically, by year of release. I know that some of these selections are not conceived of as entertainment or narrative. I don’t presuppose that the technological advances of the film industry mean that the selections get “better” as we go. Some of the most problematic content vitrified by the United States National Film Preservation Board comes late in the progression. Fasten your seatbelts – it’s going to be a bumpy night. Accessed via YouTube, courtesy of the Library of Congress. The boy faces the aperture. He is dressed in a short-sleeved shirt, long pants and high boots. He wields two long, thin clubs with knobbed handles, swinging them in synchronized grace, up and over, around. Then his gestures reverse, stutter and repeat. Meanwhile, throughout, the film cracks and flutters, rent with scratches, specks and distortions. The boy seems to be moving through a thick atmosphere, behind a fractured lens. The background is black – subject and crew are housed in the Black Maria, the film production studio crafted by Dickson and his assistants. Dickson invented film – he chose 35 millimeters as the now-standard film gauge – on the orders of his boss, inventor Thomas Edison, at Edison’s West Orange, New Jersey laboratory. Dickson called it “the doghouse,” but its confines would produce “first film” distinctly different from those produced by Eadweard Muybridge (“Sallie Gardner at a Gallop,” 1878), Louis Le Prince (“Roundhay Garden Scene,” 1888), William Friese-Greene (“Leisurely Pedestrians, Open-Topped Buses and Hansom Cabs with Trotting Horses,” 1888) and the Lumiere Brothers (“Workers Leaving the Lumiere Factory,” 1895). These films all take place out of doors, in the bright sunshine needed to register the images on the crude film stock. Here are slices of life, “real” people and events captured without their knowledge (still photographs were part of mass consciousness, but the idea of capturing movement was so foreign that the average person could not conceive of cutting capers before the new device). They are spied upon, recorded unknowingly against a blur of buildings and landscape. The Black Maria’s black background beings the figure out in sharp contrast. It isolates the subject in space as well as time, prefiguring the film industry’s obsession with effects that gradually removed more and more of the “reality” displayed by other early filmmakers in their works. The image is crisp and controlled. The camera is acknowledged, undeniably there. Dickson’s “athlete” is playing to the camera. 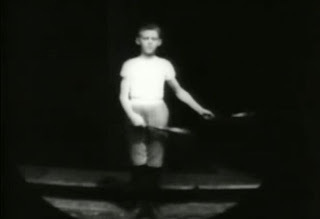 The wooden Indian clubs he swings were actually a standard part of gymnastic equipment at the time, used in choreographed exercise routines like the fragment recorded here. In isolation and without context, the boy appears to be involved in some bizarre display of skill. The act of observation iconizes the image and the actor. The movement, although it is only a muscle-building exercise in and of itself, is kinetic enough to be watchable – something Dickson could capture that would draw people, one customer at a time, to the Kinetoscope. As you look ahead to Edison’s films, you will find performers brought in – Buffalo Bill, Annie Oakley, Spanish dancers, even Prof. Welton’s boxing cats. In America, film is defined from the beginning as a product. The flatness of presentation implies the commercial, entertainment and theatrical bent of the industry to come. Film is monetized. In fact, Edison’s incredibly fierce battle for control of his product and the larger industry would lead to a Diaspora of filmmakers, away from the reach of the titan’s lawyers in such obscure hamlets as Hollywood, California. Wow - good luck with the movie viewing, you have way more stamina than me.